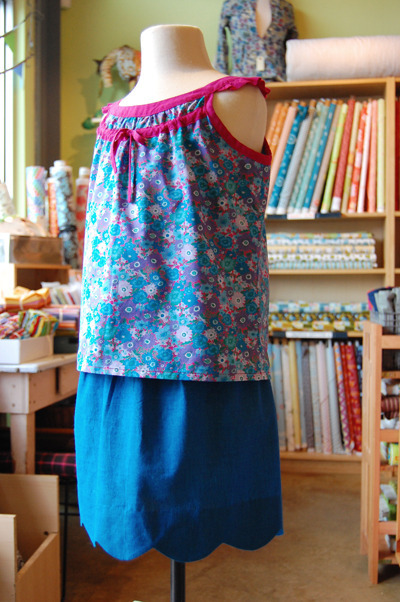 There are two new samples in the store made from one of the new Oliver + S patterns for Spring/Summer 2012. One is the Badminton Top, shown below. The other is the Badminton Skort. That’s right, it’s a skort. Bring on the monkey bars, cartwheels and sommersaults! This set is so cute. The top has a nice drawstring detail and a really sweet flutter “sleeve”, while the skort has a flat yoke waistband in the front and elastic in the back for a customized fit. Oh, and I mustn’t forget to mention the scallop hem. I was dubious about it at first, but I think it looks great and is pretty fun to do. A good skill builder. 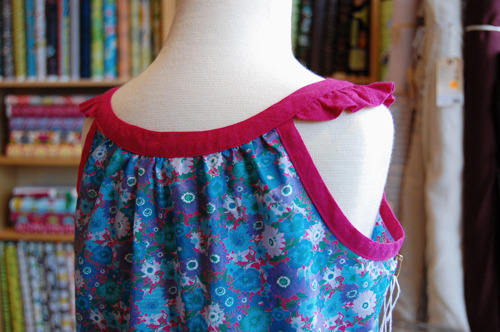 The top is made with one of the many beautiful cotton lawns we have in stock right now and for the skort and top details, the always dependable Kaffe Fassett shot cottons did the job. This sample is a size 7. I think it’s great that many of the popular pattern companies are including sizes for bigger kids in their lines. I was happy to sell this same pattern to a customer last weekend who plans to make the top for her 12-year old. There is also a dress version of the top which would look lovely on a girl of any age. You really can’t go wrong with O + S patterns. I heard it said somewhere once—and I agree—that using one is like having a mini sewing lesson. This top is a bit more of a challenge, but the skort comes together quickly. I plan to make a handful of them for my girl this summer. Just in: where do I start?